The weather is warming up, and our thoughts are turning back to sailing. It’s a good time to take a quick look back at the 2015 event, as we pivot to the 2016 event. 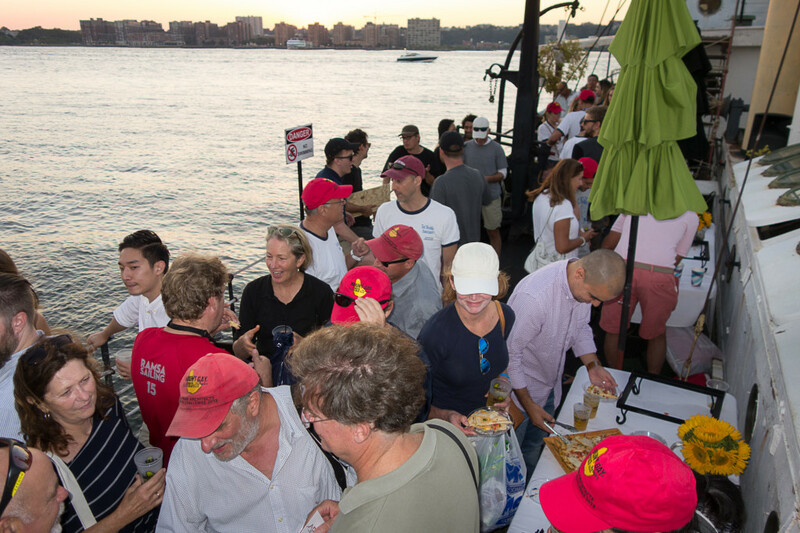 The New York Architects’ Regatta Challenge (NYARC) has two goals: have fun, and raise funds. In a year marked by a change in venue, changes in schedule, and an economy that continues to challenge us all, we succeeded in both of these goals! Many kudos to our new hosts, Hudson River Community Sailing, who pulled together a fleet of boats, and ran three well organized races. Starting earlier in the day was well received, everyone seemed happy with getting in several races instead of one or two, with none raced in the dark. And, it turns out that moving the event up river a bit worked pretty well. 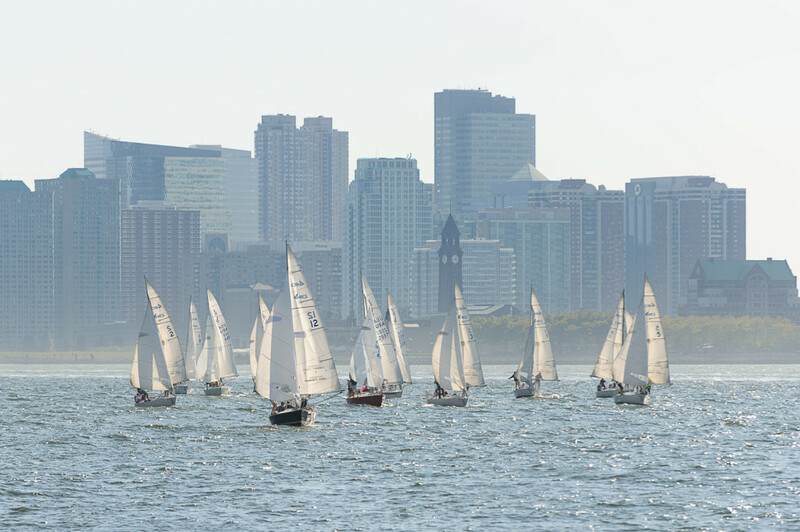 We noticed that the America’s Cup World Series is following our lead, and racing in the Hudson this spring…. Looking at the pictures from Photo-Boat, there are a lot of big grins, so the sailing part was clearly fun for all. In case you’ve forgotten, the 18 boats were competing, and Zaskoski & Notaro took the trophy for the second year in a row, with a consistently solid performance. After the racing, the Frying Pan provided the best food any of us can remember at this event. Many thanks to them as well, and to Mount Gay for providing everyone with free drink tickets! We have now broken the $100,000 mark two years in a row, which is great. We made it because several of the competing firms took it on themselves to find a sponsor to match their $1,500 contribution. That’s awesome, let’s get every firm to do that this year. What’s been happening since September? When all the mess was cleaned up, and all the accounting done, we distributed the funds to the charities we support, and they have done some amazing this with it. Rocking the Boat has expanded their program to include sailing as well as rowing. And they are putting together a college scholarship program, to continue supporting the kids whose lives they have changed through their amazing programs. Soundwaters has merged with the Young Mariners Foundation, dramatically expanding their reach. They continue to get school kids into boats, and out into the long island sound. Dee Smith is one of 21 sailors named to the 2016 US Sailing Team Sperry, a huge step towards representing the United States at the 2016 Paralympics. Hudson River Community Sailing has been named Outstanding Community Sailing program of 2016 by US Sailing. Riverkeeper continues to advocate for the Hudson River and the drinking water supply of 9 million New Yorkers, fighting the possible damage done to us all by crude oil transport, fracking, nuclear holocausts (really, it’s a concern). We will have more fun! We’ve booked the New York Yacht Club for the skippers meeting, again. It seems to work; but this time, we’re going to have more bar tenders. Having the party on Wednesday seemed to work better for most people, so we’re keeping that schedule change. Save the date: September 14! We’re going to move the after party, but only by a boat length or two. We’re going to party on the fan tail of the Frying Pan so we can spread out, and also so Daniel Frisch won’t have to risk life and limb balancing on the superstructure to announce the winners. We’ll give him a real podium this year, and maybe a microphone. We will raise more money! We’re signing up new sponsors, and our regular sponsors are all expected to return, To ensure we have the right mix of caffeine and other, Nespresso, Mount Gay, and Frederick Wildman will be there. We’ll keep you posted as familiar sponsors re-enlist and new ones join the party. Tell all your friends and colleagues. The more architects at this event, the better. Like the Regatta’s Facebook page – our social media footprint is something sponsors notice. Like us, get your friends to like us. Get everyone in your firm to like us. Get a sponsor. Seriously, if each participating boat brings in a sponsor or two to match their entrance fee, we step up our fund raising a notch. Get involved with the NYARC: We could use another committee member, or two. Are you interested?